Download the book for free. Limited Time Offer! Currently selling on amazon for $19.95, for a limited time we are offering a digital copy. Complete your details to get your free download! 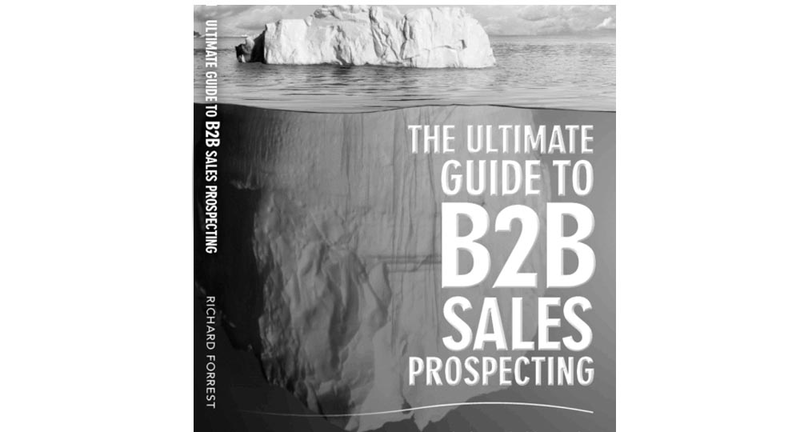 The Ultimate Guide to B2B Sales Prospecting takes you through the step-by-step process of lead generation and sales prospecting. Following this simple 4-step process, you will be able to engage your ideal prospects before they start looking. In this book you’ll learn how to design a sales strategy, define your market, perfect your pitch and how to measure your lead generation and sales prospecting results. By following the steps outlined in this book, you’ll be uncovering the sales opportunities below the surface; those who are living with a problem but haven’t started to look for a solution. This book is all about how to get below the waterline. How to first identify and then engage with the much larger group of sales prospects hidden under the surface. As the Founder and Managing Director of Forrest Marketing Group, one of the top B2B telemarketing and lead generation call centre companies in Australia, I have built my business around doing just that. My team and I have been prospecting and generating leads beneath the waterline, exposing the sales opportunities for our clients under their icebergs since 2006. Each year we generate millions of dollars of new sales opportunities for our clients using the 4-Step Sales Prospecting approach outlined in this book. Looking for more sales prospects? FMG offers a full range of call centre services including telemarketing, lead generation and appointment setting. Our Account Managers can help you develop a sales strategy to help you find new sales prospects and increase revenue. Our Australian sales agents find thousands of new sales prospects which generate millions of dollars of new business for our clients every year.